Waffle Wednesdays in the Orleans Room! As every informed Loyola student knows, we wear maroon and gold on Wednesday’s. Another Wolf Pack tradition that goes back years and years is eating waffles! 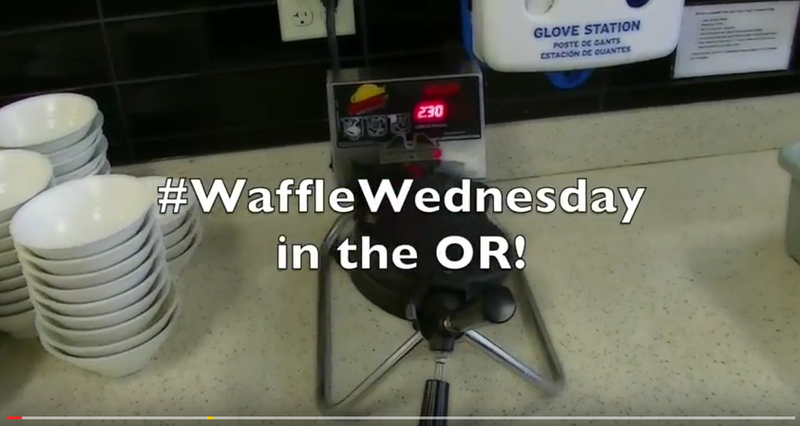 This semester, the Orleans Room has started creating waffle sandwiches for your pleasure every Wednesday for lunch. Over the past three months since we started this delicious program, we have served a variety of awesome waffles. Some of the sandwiches include — Chicken and Waffles, Peanut Butter and Jelly, Club Sandwich (w/ choice of ham, turkey, cheese, and bacon), and you can even customize your own waffle! Would you like to see a different type of waffle? You can email me, Ben, at DearBenSodexo@gmail.com! Every day I read through the emails and promptly notify staff to create new changes to the Orleans Room. Once a month there is a fun blog post that shows my responses to the questions, and any new updates that need to be announced! I love to hear your suggestions, and we want to make sure you are eating the things you love. Another great way to give feedback to us on what you want changed is by joining “LUDAB” aka Loyola University Dining Advisory Board. Open to all Loyola students, this group meets once a month for a catered lunch with our staff, and gives us feedback on their dining experience. Not only does your voice get heard, and you get a great meal, but you also get ten wolf bucks just for coming! Want twenty wolf bucks? Bring a friend! This committee helps us understand what you, the student body, are looking for in your dining services. Happy Wednesday Wolf Pack, eat waffles, go forth and set the world on fire!